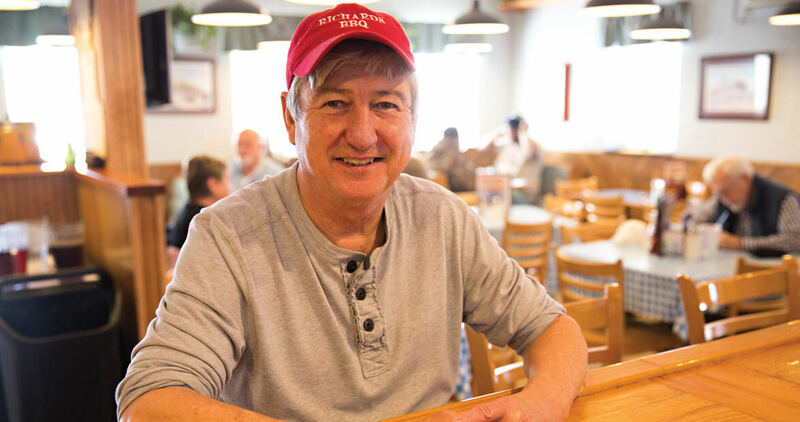 Good food springs eternal from Richard Monroe’s wood-fired barbecue pit in Salisbury. Barbecue has been here since before we invented ways to remember it, and it’s impossible to imagine that it won’t continue to exist through the next Ice Age, or Dust Age, or whatever the future throws at us. The barbecue joint itself, however, is a relatively recent phenomenon. Though men have been cooking over a pit since who knows when, the addition of menus, barstools, and a waitress might have happened in the lifetime of someone you know — someone really old, sure, but the math holds up. And it’s still possible to find barbecue restaurants that have been around for many decades, some of which haven’t changed much since they opened their doors. Most have withstood a fire or two, which is bound to happen when you bring a big box of flame with a pig on it indoors. Barbecue restaurants are unpretentious, friendly, warm places. Walking into one of them is like walking into a time machine, even if that time machine only goes back as far as 1979. That’s when Richard Monroe opened Richard’s Bar-B-Q, on Main Street in Salisbury, right between the courthouse and the railroad station, and that’s where it stands today. From the outside, it looks like somebody’s house — somebody’s colorful house, white-bricked and red-roofed. The only giveaway that it’s not a house is a red-and-white-striped awning, glass doors, and a big sign on top: “Richard’s Bar B-Q.” There’s another sign in the parking lot, visible from the road, which says “Richard’s Bar-B-Q.” Note the missing hyphen on the first sign — or, alternatively, the extra hyphen in the other. Here’s the thing: No one agrees on how to represent the word barbecue in signage. Most etymologists believe that the word derives from the Caribbean word barabicu, meaning “sacred fire pit,” which is almost too good to be true, since the pit does seem sacred to so many people. But once the word got to America, it underwent a profound transformation. You will see it spelled BBQ, bar-b-q, bar-be-que, bar-b-que, bar-b-cue, bar b-q, bar-be-cue, and even, sometimes, barbecue, which is how I spell it. Richard Monroe spells it two ways, which is a testament to the historical lineage of the word. God bless the poor Tar Heel who’s asked to spell barbecue in a spelling bee. and sundry sandwiches, and, yes, a hamburger, too. More than a few customers turn up every week to order one of those meals, because after 35 years, they feel a casual intimacy and familiarity with Richard’s — not just with Richard and the staff (many of whom have been there 10 years or more), but with each other. The restaurant feels like a church, where you know who’s sitting in the pew behind you, only at Richard’s, it’s not a pew but a booth, and there’s no pulpit here, just the sacred fire pit. I suppose that makes Richard the preacher. He worked for 10 years at T&F, right down the street, which by all accounts served some excellent barbecue. He was the manager there for a while — “I kept track of the money through the week and gave it to them on the weekends,” he says — until he opened his own place in what used to be a trailer park, bringing the staff and the customers with him. It wasn’t always smooth sailing: The transition from managing an establishment with seven stools at a counter to a real restaurant was challenging, and in the first year, he didn’t know if he’d get to the second. Then, of course, some time later, there was a fire in the pit, which damaged the kitchen and the dining room as well. “I was on the phone,” he says, as if, had it not been for a single telephone call, he might have avoided this almost predestined conflagration. But with the help of the community and Salisbury-based businesses, he was back up and running in six days, working every day, round the clock. Not much has changed in 35 years, Richard says; in fact, nothing has. The sauce, eastern-style, has not been fiddled with in all that time, and slaw is the vegetable of choice. He gets up at 4 or 5 every morning to open the place up: They serve a good breakfast at Richard’s, where you can get eggs with livermush if you want it, something I can’t imagine wanting, but that’s just me, I’m sure. He still chops the barbecue the same way he did the year he opened. “I even have the same cleaver,” he says. But it’s more than just the barbecue that hasn’t changed. Inside Richard’s, the world turns into a better place. It turns into what you might imagine the best part of the ’50s was like. Everyone knows each other, is there for each other, and even strangers are given the benefit of the doubt. This isn’t nostalgia: This is real. There’s a sign as you enter Richard’s — “Cash or Check Only” — but for those out-of-towners who visit with only a credit card, Richard gives them the bill and asks them to send a check when they can. Invariably, they do. “Honesty pays,” he says. “Trusting people.” Lawyers from the courthouse eat here every day, and there’s not a little gossip about this and that and the other. Richard runs tabs, the lawyers sign tickets, and he bills them at the end of the week. I have heard of this kind of humanity happening, but I’ve never believed in it, until now. Before I leave, Richard takes me to see the pit. He’s finished cooking for the day, so it’s empty, and a bed of ash coats the bottom. But then he rakes back a layer, and there are coals beneath it, burning a bright orange, thrumming the way they do. It’s like this every morning: He just throws some hickory in there and the fire starts right up using coals from the day before. This means that a descendant of the first fire he lit might be burning today, and has been for the past 35 years. That’s what I like to believe, anyway. Talk about sacred. Wallace is the J. Ross MacDonald Distinguished Professor of English and director of the Creative Writing Program at the University of North Carolina at Chapel Hill. He is the author of six novels, most recently Extraordinary Adventures. His illustrations have appeared in the Los Angeles Times, Italian Vanity Fair, and many other magazines and books. His novel, Big Fish, was made into a motion picture by Tim Burton in 2003.